Here are some of the key facts about VE Day. The VE in VE Day stands for Victory in Europe. It was the public holiday of 8th May 1945 to mark the defeat of Germany by the Allied forces in World War 2. More than 1 million people celebrated in the streets of cities, towns and villages in the UK. 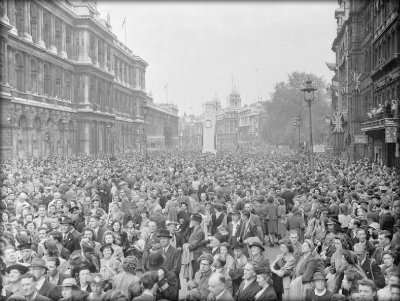 Crowds gathered in Trafalgar Square and up The Mall, waiting for Winston Churchill, the wartime Prime Minister, and King George VI to make an appearance on the balcony of Buckingham Palace. In the United States, Harry Truman, the President, dedicated the victory and celebrations to President Franklin D. Roosevelt, who had died just a month before victory in Europe was achieved. Celebrations took place in many US cities, including Chicago, Miami, LA and New York. In 1995, to mark the 50th anniversary of Victory in Europe was, May Day Bank Holiday in the UK was moved to 8th May. VE Day did not mark the end to all of the fighting associated with World War 2. Japan didn’t surrender until 15th August 1945 (or 14th August, depending on time zones). Japan officially signed surrender documents on 2nd September 1945, effectively bringing World War 2 to a close. This is celebrated as V-J Day (Victory over Japan). Glad you found it useful, Judy. Thanks for letting us know. Thanks, Daniel! Look forward to seeing you at Primary Facts again soon! This Information Is … AWESOME!!!!!!!!!!!!!!!!!!!!!!!!!!!!!!!!!! this website is awesome I get some really good facts from it and my homework always gets good marks!!!!! Thanks 🙂 My homework got full marks! 😀 from now on im using this website! Thanks, Jeff. Glad you liked it. really useful for my homework ,got what I wanted .thanks soooooooo much!!!! This is really helping me with my homework!!!!!!!!!!!!!!!!!!!!!! !